Two of the tires are in good shape, the other two needs to be replaced. They are six lugs. Asking $450 because that’s what I paid for them. 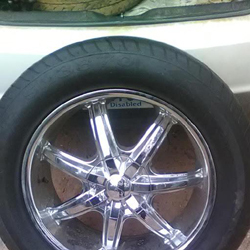 This entry was posted on Friday, January 25th, 2019 at 12:07 am	and is filed under Classifieds. You can follow any responses to this entry through the RSS 2.0 feed. You can leave a response, or trackback from your own site.